On October 8 BCHN presented a benefit jazz concert and awards event at the Bronx Museum of the Arts, featuring music by jazz trio The Kevin Harris Project, led by internationally acclaimed New York-based jazz artist Kevin Harris. The program was emceed by BronxNet's Rhina Valentin. The event benefited expansion of BCHN’s community health and wellness programs, including prevention and management of diabetes, hypertension, asthma, HIV/AIDS, behavioral health and opioid use, as well as insurance assistance and care coordination for supportive resources. If you were unable to attend, donations can still be made here. "The road to good health begins with education and a personal commitment to take steps to prevent illnesses that are preventable," said Bronx Community Health Network CEO Eleanor Larrier. 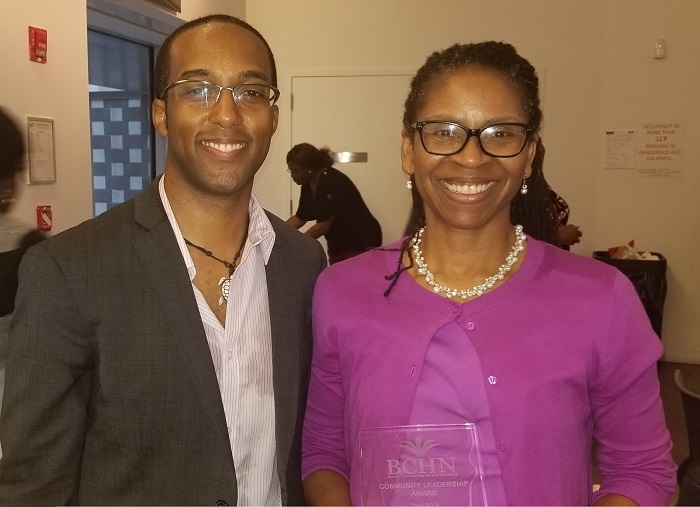 “And BCHN is proud of the important role the organization is playing to ensure that Bronx residents have the information and resources to manage their health, including access to affordable, quality health care and support services." Pictured above with Kevin Harris is Community Leadership Award winner Dr. Susan Beane, Vice President and Medical Director at Healthfirst. Dr. Beane was honored for her leadership in establishing innovative community programs in NYC neighborhoods.